White is often associated with the plain and the ordinary. This becomes especially true when it comes to home improvement installations. Renewal by Andersen® of St. Louis, however, considers white trim a canvas for greater creativity. Your trusted Chesterfield, Missouri windows company looks at three simple yet creative ideas that will help transform your home into a more elegant place. You get replacement windows in Chesterfield, MO, to improve the look of your home. If it already sports darker colors inside and outside, white certainly st ands out brightly. This works best when you pair it with darker, near-blacks on your exteriors. This is where the contrast will be sure to grab more attention. For the interiors, you can opt for subdued shades instead to preserve the idea of contrasts without casting your home in a deep gloom. The key to making this combination work lies in providing a single focal point for the eyes to follow. It helps to pick an element that draws the eyes and breaks the monotony of the white. This is best accomplished with a splash of loud color. Reds and oranges work well with this concept. A line of color at eye-level should be enough to make this work and break the idea of the plain, boring whites. Another beautiful use of white trimmed windows involves pairing them with wooden paneling. The concept mirrors the effect of contrasts, but also plays with the natural beauty of woods. White becomes the st andout element once again, pulling visitor’s eyes to the windows. Like with our range of Chesterfield doors, you can also customize our windows. This is possible with our range of grills and separators to enhance the look. We have a wide range of window styles that readily fit different design concepts. 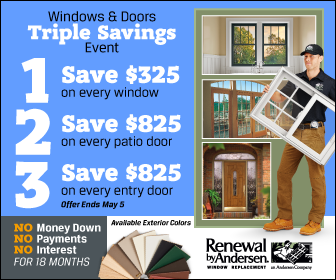 Call Renewal by Andersen of St. Louis today and we’ll help find the one that fits your home.